This is a very short book from Feynman (~120 pages of actual text) and comprises of the transcripts of 3 lectures he gave in April 1963. They are as far removed from his technical lectures as can be imagined, so are easily accessible to the lay reader. The impression I got was that these lectures are Feynman trying to find his own mind, by talking out loud and seeing where the train of thought goes. In fact he admits that he covers all the key ground he wants to in the first two lectures, and these are noticeably more coherent than the last one, which takes up nearly half the book. He covers various topics, though the key themes are uncertainty and the limits of science. He does touch on some potentially incendiary ground such as religion and politics, though he always measured and reasonable, never resorting to polemicism or off-handed dismissal. There is some evidence of the threat presented by the Cold War in the lectures. Feynman’s virtue as a scientist is present throughout, as he is quick to put down the “argument from authority” though he doesn’t quite name it as such. Probably of most interest to the modern reader is the interaction between science and religion. Here, Feynman takes a very reasonable and fair-minded approach, more akin to Stephen Jay Gould than the ranting polemic of Richard Dawkins. He is also quite firm in the belief that scientific methodology cannot rule on morality; that is, there are subjective things in this world that are beyond the reach of science. At times, he does get close to waffling a little bit, and the fact the book is taken verbatim from his lectures means that he interrupts himself on more than a few occasions. The book certainly provides food for thought, and I would recommend it to anyone interested in the place of science in society. It is probably not the best introduction to Feynman and his work (for that, I would recommend Surely You’re Joking, Mr Feynman) though for those familiar with this other work, this will be a valued addition to your RPF library. This book was my first foray into Russian literature, though I have a fairly log way to go before I progress onto War and Peace. The Master and Margarita is one of those books that crops up occasionally on “top 100” lists of 20th century writings, so I thought it was worth a peek. The style of writing requires close attention; it’s not a book for the casual reader, and very often I found myself having to go back a few pages in order to pick up a reference I had glossed over but which played an important part in the plot. Bulgakov played around with the title a lot before settling on the final one we have now, and this somewhat evident, as the title characters are noticeable by the absence in the first half of the novel. The story rather focusses on an unholy trinity that have wandered into Moscow and start wreaking havoc amonst the population. The story begins with two atheists in a park discussing the non-existence of Jesus, and dismissing Immanuel Kant’s “proofs” of the existence of God. Along comes a mysterious stranger who is delighted by their atheism, but kindly points out that, after having had breakfast with Kant and having been witness to Jesus’ condemnation by Pontius Pilate that Jesus is as real as the devil. Proof of this is then provided with a macabre prophecy which is fulfilled in intimate detail shortly thereafter. The story does contain some brilliant passages, probably the most entertaining of which is the show (or séance, as it is referred to) held by Woland and his compatriots in a theatre, which reminded me somewhat of a more extravagent version of a Derren Brown live show. In fact, if this were to be made into a modern, I would recommend that Woland be played by Derren Brown, though of course I am not suggesting that the latter is Satan incarnate. The other fantastic scene is also where the novel strays from realism into a more surreal mode, is the great ball at Satan’s. Returning again to the film analogy for how I would see it, the film would have to be directed by Terry Gilliam.SO I hope that gives you some idea of the kind of weirness that goes on in the book. There were a few things that annoyed me about the book, though, and I cannot let these pass without mentioning them. Bulgakov has a habit of dropping some characters out of sight for long periods and also of introducting new characters who play an important role but about whom we have very little information. I like to form a mental picture of each character as they are intoduced, but they are shoved right into the thick of the action and so I was not easily able to do this here. The title characters are still a mystery to me, as I could not fathom their precise purpose. They are deliberately mysterious and do help, later on, to develop the progress of the storytelling, though I am still uncertain as to their precise meaning. However, that may be due to my own ignorance of the context in which it was written. For this is more than a simple story; it is a sature of life in Stalinist Russia, and the pall of totalitarianism hangs over the novel like a dark shroud thrown over the city of Moscow by Woland. Not being very familiar with this era of history, I am sure there are many references and metaphors which I missed, but which would enhance the reading experience of those more enlightened than I.
I think I will read this again at some point in the future, but only after I have educated myself more on the historical setting. For those already familiar, I am sure this is to be seen as one of the great novels, though some parts of it are, for those like me, seemingly random or purposeless. Before I start this review, it needs to be pointed out that there are really two books here. One is the Didache itself, and the other is a book about the Didache. For purposes of clarity, I will refer to the former as the Didache and to the latter as O’Loughlin’s book. For some reason, which I cannot fathom, the Didache itself is put at the very back of the volume, making it look more like an appendix. So I was forced to read the ending before I could start on the introduction. It is a modern English translation which is perfectly understandable and doesn’t take long to get through, as it is only 10 pages long. For those of you have not come across this before, the Didache is a sort of handbook for new christians. Much of it will already be familiar, as some of the text is taken straight from the canonical gospels. It is not regarded as part of scriptural canon by the majority of christians, though it is a useful insight into how the early christian communities lived. From a reading of it, it is clear that it doesn’t have the theological richness which we would associate with the books we find in our modern Bibles. So having read the text that is to be analysed, we move onto O’Loughlin’s book. He starts with the story of how it was rediscovered in the 19th century, having been lost for over 1,000 years and the only way we knew about its existence was a few references in other writings from the first few centuries of christianity. Now while O’Loughlin does, at a few occasions, try to write with an even-handedness, his own theology and interpretation does break through, and this does sour the book somewhat. For example, while the idea of the Two Ways is a dominant theme in the Didache, O’Loughlin chooses to skip over much of this and spends a disproportionate amount of time in the book talking about the Eucharist, or communion, as most christians call it. This shows us that he takes a particularly Roman Catholic stance, and this is evidenced elsewhere by his use of other non-canonical texts as being equally authoritative as the Bible, with no delineation point discernible. O’Loughlin’s lack of rigorous scholarship shows itself as he also advocates a few minority views and misrepresents the weight attached to these views. For example, while the gospel with the Didache is most closely paralleled is Matthew, there is some debate as to which came first: Matthew or the Didache. O’Loughlin takes the stance that it was probably the Didache which was written first, or at least that they were written at the same time. He also appears to subscribe to the ideas of the Jesus Seminar, where at one point he refers to Matthew putting words in Jesus’ mouth, seemingly dismissive of the idea that the author of Matthew might have actually been recording words that Jesus said. This lazy scholarship does mar the book somewhat, and I was surprised to see it got passed the editorial board of SPCK (the publishers) who normally have such a high standard. So with that aside, we have try and read O’Loughlin’s book through the distortions, much like trying to do ground-based astronomy, counteracting atmospheric disturbances. What we end up with is a very low-level introduction to early christianity for those who may look at the modern strands of christendom and think that one modern denominational church basis itself on the early christians. In this manner, O’Loughlin seems to be having a go at some Catholics, where phrases are banded about such as “one true church” or who still propound the myth that Peter was the first pope (in spite of the fact that the earliest evidence for anything resembling a papacy didn’t emerge until the 6th century). As to the date of the Didache, it seems to have not been in widespread circulation until at least the end of the first century or perhaps even the early 2nd century. No single or small group of authors is ever identified, and the Didache does seem to be a compilation derived from several sources. One of these may be the gospel of Matthew (or at the very least, the same oral tradition of which Matthew’s gospel is the written form) but also of the practices that the early christians had adopted and were looking to turn into traditions. So the Didache is much more a forerunner of modern “lifestyle christianity” books than theology, and this is why I think it is worth reading, but when measured alongside the rest of the New Testament, it falls short of the level of depth that we see elsewhere. There are plenty of other books that put across the history of the early church much better than O’Loughlin does, and where the Didache is considered in the context of other non-canonical writings of around the same period. So I would recommend anyone read the Didache, which can be done online, though there are plenty of better books on the early church than that written by O’Loughlin. An interesting piece here from the Independent entitled “The Islamification of Britain” though it is more reasonable that the Daily Mail-esque headline suggests, given that the numbers spoken of are in the region of 5,000 converts per year. A programme I heard on radio 4 the other day (not available to users outside the UK, and not available for more than a week after broadcast) about the reasons behind the motif “pink for girls, blue for boys.” Fans of the website pinkstinks will appreciate this. I am not sure why it has cropped up in discussions all of a sudden, but the issue of breastfeeding seems to have come to the fore. Here is a small sample of testimonies from the Guardian. Staying with the Guardian, here’s a puzzling article on an American university offering a degree in “secular studies.” Unfortunately, neither the author of the article nor the university seem to understand what secularism is. However, when I pointed this out, my comment was deleted. Just goes to show, atheists are just like the rest of us: petulant when shown to be wrong. This is a nice time-killer. Play rock-paper-scissors against a computer. I tried using a random number generator to eliminate any element of predictability. In other news, I finally got round to publishing my 100th review on Amazon. Most of them are the same as here (although some the longer posts on the blog were trimmed for Amazon purposes). Feel free to peruse the rest. Here’s a little proof I knocked up over the weekend. 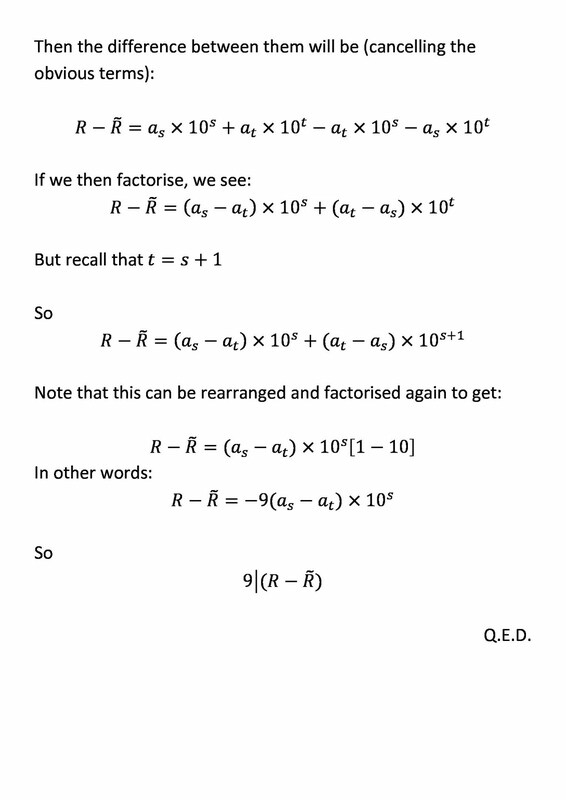 Sorry it’s in a picture format, the platform on which this blog is based can’t deal with simple mathematical symbols, so I had to convert a document into a couple of pictures. 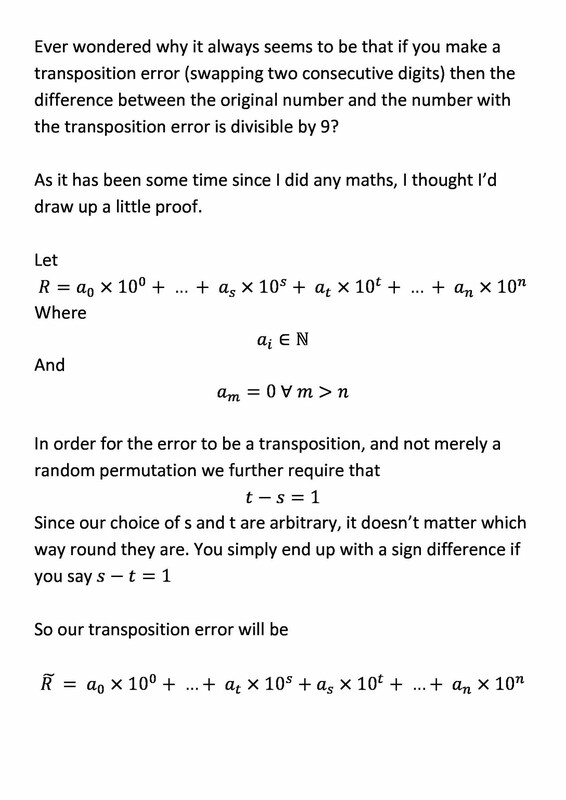 If you click on the pictures, you should be able to see a larger version of each of the two pages of the proof. I am writing this to explain why I will be voting FOR the Alternative Vote (AV) system at the referendum on the 5th of May. This is not to be an holistic account on the reasons why AV is better than First Past The Post (FPTP), though at the end I shall include a number of links which you may follow up which contain far more than I have here (and which are probably better written). To my mind, there are two main issues: one of principle and one of pragmatism. To cut straight to the chase, I’ll go for the principle issue first. It will allow me to vote for who I want to vote for. In the last election, I lived in the smallest Labour majority in the whole country. The Labour MP was stepping down and the 2nd place party, the Conservatives, had the leader of the local council as their candidate, who was also the guy who narrowly lost the previous election. Taking this into account, along with the national swing in opinion, it seemed likely that the Conservatives would win here and the only realistic opposition in the constituency was the Labour party. Now I had no desire to see either of the candidates from these parties elected to represent me. But, having one party very clearly the lesser of the two evils, the only way I could vote to keep out the greater of the two evils, I was effectively forced to vote for a candidate I didn’t want. This is the heart of tactical voting, which would be completely unnecessary under AV. I am not the only one to do this. Under the present system, many people are forced to either vote tactically or to waste their vote by sticking to who they want to vote for knowing that it will have no effect on the outcome, since their candidate doesn’t stand a chance of winning. So by allowing more people to vote for who they want to vote for, the AV system is inherently more democratic than FPTP. All I do with AV is number the candidates in order of preference. That’s all. Instead of an X in the box, the only added complication is being able to count 1,2,3,4,5….n where n is the total number of candidates – rarely more than 10 and frequently closer to 5. So any scaremongering you’ve heard about it being complicated are unfounded; either that or they have been proposed by people whose intelligence is severely impaired. So had AV been in place at the last election, I would not have had need to put my only X in the box against the candidate who was not my first choice. I would have been able to have them down the list, probably at number 3 or 4. My first choice would get the vote they rightly deserved which I had been forced to rob them of under FPTP. I would not have been the only one, either. AV would allow the votes in all constituencies to properly show the balance of where people’s priorities lie, and that is what democracy is all about. Let’s take an example to show how AV is better than FPTP. Let’s take a simple constituency where there are 3 candidates. One candidate has a set of policies which are largely going down route A. They have 40% of the vote of share of the vote. Then we have 2 other candidates, which share similar ground and broadly go down route B. They each have about 30% of the share of the vote (let’s say it’s 35/25 for simplicity). Under FPTP, the minority view wins. The majority is ignored and we have an undemocratic imbalance. With AV, those supporters of route B would likely prefer the other candidate who is similar to theirs as a second choice, so when one is eliminated, the votes from the losing candidate are transferred and the majority 60% gets their views elected. OK, onto the practical side of the discussion. One of the things that has tarnished the elections have been the lies; they have come from both sides of the argument, though most vociferously from the No campaign. Here, I will address only 2 of them. The first of these is cost. The No campaign claim it will cost £250m to implement AV. They break this down as follows: £91m for staging the referendum, £130m on electronic vote counting machines and £26m on explaining the system. Now the £91m is a sunk cost, incurred anyway. So it would be equally valid (invalid) to say that £91m is the cost of keeping FPTP. To claim that this is variable cost is fraudulant, misleading and should be refuted by anyone with a modicum of sense. The £130m on coutning machines is a fabrication. There would be no counting machines under AV. Counting would still take place as it always has done. Anyone peddling this as a variable cost is either lacking in understanding or is lying to you. Please correct them appropriately. The only hint of truth in this is that AV counts will take slightly longer if there are multiple rounds of voting. In the vote count process, you must first separate the votes and then count them, so in the event of a second round, those of the candidate who has been eliminated must be re-distributed before all the votes are added again. So I would anticipate that an all-night count (as we have presently) might either be delayed until the morning or else results would start to come through some 2 or 3 hours later than they are the moment. Finally, the £26m to explain to voters. This is a fictional amount, as information on AV is already widely available and there is no need to incur a large expense explaining it. Again, if you hear anyone proposing this as a reason not to vote for AV, they are wrong and please do your best to show them reason. The other point I’d like to note (and thanks to one of my friends for highlighting this objection) is that AV revokes the notion of “one person, one vote” by allowing one person to have more than one vote. i.e. a small number of people have an undue influence of the election. First of all, it needs to be remarked that as we stand at the moment, only a minute minority have any effect on the outcome of the election, given the existence of safe seats. If you are a conservative supporter in the City of Durham, then your candidate currently stands no chance. On the flip side, a place like Horsham is somewhere my dad describes as “blue ribbon on a pig country.” AV doesn’t put an end to safe seats. Indeed about a third of the seats in parliament would be completely unaffected as they have a majority in their own constituencies. It is the two-thirds where the candidate gets elected having failed to obtain the majority of the votes cast that are likely to be affected. Also, not all of these will necessarily have their results changed by AV. A lot of examples used (see example above and the one below) tend to assume that all of the second preferences for one candidate go exactly the same way. In reality, this is unlikely to happen, and there will be a spread. So while AV is inherently more democratic, that doesn’t mean it will always produce a different result to FPTP; it simply takes a more careful look at the marginal seats and sorts these out more fairly. The particular example that my friend used was as follows: at first preference, candidate A obtains 46% of the vote. Candidate B obtains 44% of the vote and candidate C obtains 10% of the vote. After the first round, candidate C is eliminated and then the second preferences are distributed among the remaining candidates. In this instance, similar to my example above, all of candidate C’s second preferences go to candidate B. They then threw in an extra fact: all of A & B’s second preferences went to C. Their argument was that the supporters of candidate C had their votes counted twice while the supporters of A & B only had theirs counted once; whereas had the second choices been counted that C would have won. The fallacy here is that on the second round of votes, only the second preferences of the eliminated candidates are taken into account. This is plainly not true, as all the first preferences from the remaining candidates are consisdered again. In this example, it seems clear that those who prefer C would much rather have candidate B has their MP than candidate A. So the fact that under AV, candidate B would win is totally democratic. Candidate B will have obtained the majority of the votes, which candidate A never would have, thus meaning that the majority of people would like candidate B to represent them. If you think that the majority of the people should be ignored (i.e. not a democratic solution)then by all means vote ‘No.’ But this example again shows that of the two, AV is fundamentally more democratic than FPTP. The point of AV is that the most number of first preferences are considered. So the fact that those who supported A had C as their second choice is totally irrelevant so long as A is still in with a chance of winning. If you are supporting Arsenal, would you really want Chelsea to win the Premiership just to stop Man U winning it while Arsenal still have a chance? It needs be noted that first past the post is a bit of a misnomer, as there is no post to get past. In that respect, AV is far better described as having a post, as you need a majority to win. One of the photos on the no campaign leaflet I got was of the finishing line of a sprint race, where it stated the first person won under FPTP while pointing to the guy who finished last and said that he was the winner under AV. This is deliberately misleading, as a race has a set mark that you need get past. So if we stick with the analogy, it is more accurate to state that FPTP stops a 100m after an arbitrary time period (which would be different for every constituency); say, stopping the race after 8 seconds and declaring the winner to be whoever happens to be in the lead at the time. It doesn’t take into account runners who fade away at the end, nor those who have a strong finish. AV would take these into account and the first past the 50% threshold (in the analogy, the 100m mark) would be the winner. Now AV is not the be all and end all of political reform. There are plenty more other things which need to be sorted out. My personal bug-bear is the fact the members of the cabinet are appointed by the prime minister, rather than democratically elected on their own merit. However, referenda are so rare in this country, and so binding when they take place, that we cannot afford to miss this opportunity to make a small improvement. As an example, during the last couple of years of the last Tory government in the mid-90s, when Euroscepticism was at its peak, there was a lot of talk about holding a referendum about whether Britain ought to stay in the EU or to withdraw. This referendum never took place, with the one of the main reasons put forward being that “we” voted for it in the 1970s. Now, many of the more elderly electorate who voted it in had died since then and many of the contemporary electorate had been ineligible to vote in the 70s due to their age (or having not been born at all). If a “no” vote wins on Thursday, then it likely be the last chance this generation will get to make an improvement to our electoral system. Some have some said this is an opportunity to give David Cameron a political black eye, but I disagree with this. The vote is an investment for the future. While it is true that the Conservatives will likely lose seats at the next general election if AV is adopted, but then that will be the chance for us to end Cameron’s time as prime minister, not now. No voting system is perfect, but when we compare the two options we are given, AV is by far more democratic than FPTP. So please, listen to reason, to good sense and vote yes to AV on Thursday.